When Narendra Modi became India’s Prime Minister in 2014, monarchists in Nepal hoped he would help roll back secularism and restore their Hindu kingdom. This week, after Modi’s sweep of state elections and the installation of Yogi Adityanath as Chief Minister of Uttar Pradesh, that hope has been revived. Modi has so far carefully refrained from pushing for a restoration of Nepal’s Hindu monarchy, abolished by the Constituent Assembly in 2008. But Adityanath wants Nepal’s secular and republican constitution scrapped, and even demanded the restoration of the Shah monarchy during a Hindu jamboree in Kathmandu last year. The fact that Adityanath is the head priest of the Gorakhpur Peeth, the patron deity of the Shah dynasty, has emboldened the newly resurgent RPP. It staged a protest this week against the Election Commission’s removal of ‘monarchy’ and ‘Hindu nation’ from its statute (pic, above). Journalist Yubaraj Ghimire, who covered India’s Hindutva movement during the Babri Masjid Demolition in 1992, disagrees. “Chief Minister Adityanath may not have the power to restore Nepal’s Hindu monarchy, but he can use his political clout in New Delhi to reshape India’s foreign policy vis-a-vis Nepal,” says Ghimire, now editor of Annapurna Post. He sees the beginning of the end of the Shyam Saran Doctrine that laid out India’s strategy on Nepal. The former Indian ambassador and foreign secretary was the architect of the 12-point deal signed in New Delhi in 2005 between Nepal’s mainstream parties and rebels against the monarchy. 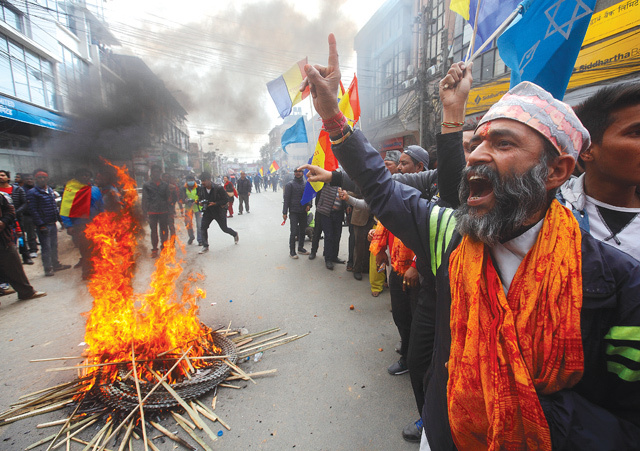 “That doctrine is failing because Saran believed Beijing’s influence in Kathmandu would decline once the monarchy was gone, but the opposite happened,” Ghimire adds. Meanwhile, Nepal’s secularist republicans are now getting nervous that India will do a U-turn. At the international elephant polo tournament in Chitwan last week, enthusiasts played "one of the worlds fastest games on one of natures slowest beasts." The coppersmiths of Palpa may not have seen a computer, but e-commerce has changed their lives and fortunes and is helping to bring others back home.